Kit no. 6020 "1939-1945 series"
The Volkssturm (German pronun­cia­tion: [ˈfɔlks.ʃtʊɐ̯m], "people's storm" was a national militia established by Nazi Germany during the last months of World War II. It was not set up by the German Army, the ground component of the combined German Wehrmacht armed forces, but by the Nazi Party on the orders of Adolf Hitler and its official existence was not announced until October 16, 1944. It was staffed by conscripting males between the ages of 16 and 60 years who were not already serving in some military unit as part of a German Home Guard. DML Dragon is a prolific model company based in Hong Kong, China. They manufacture all manner of model subjects in the popular scales. This kit comes in a shrink-wrapped end opening type box. I am no fan of this type of box, because inavariably the decal sheet or parts find their way past one of the end flaps to become lost forever. Give me a tray and lid type box any day of the week. 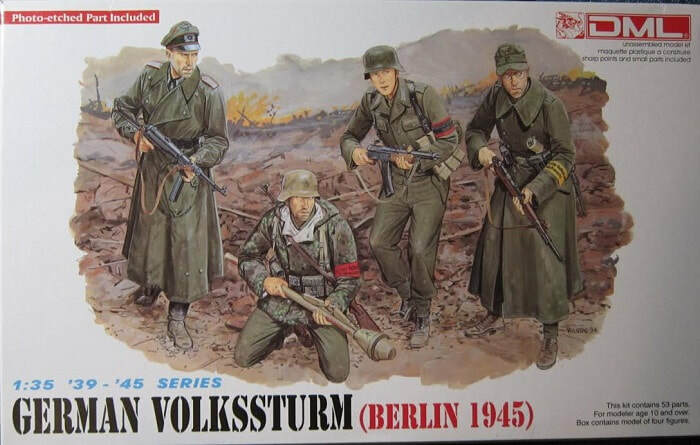 The box art shows 4 volkssturm troops posed with rubble in the background. Three troops are standing and one is kneeling on both knees. Two of the standing figures are wearing long leather winter coats. One of them has an officer's peaked hat on his head. He wears black jack boots. The other standing figure wears a cloth peaked field cap. The figure in the officer's hat is armed with a MP40 submachine gun. The one with the cloth field cap has low shoes on and he is armed with a 98K carbine. He also wears glasses, which will be made with the steel PE part in the kit. The 3rd standing figure wears a steel helmet and his pants bloused above low shoes. He is armed with a MP44 assault rifle. The kneeling figure wears a reversable parka and a steel helmet. He is armed with a panzerfaust. One corner of the box art says that the kit is designed for modelers over the age of 10 and that it holds 53 parts. One side panel of the box shows 3 color box arts of other kits that DML markets: kit no. 6018, a Soviet JS-2m CHkZ production tank, kit no. 6012, U.S. Rangers (Normandy 1944). 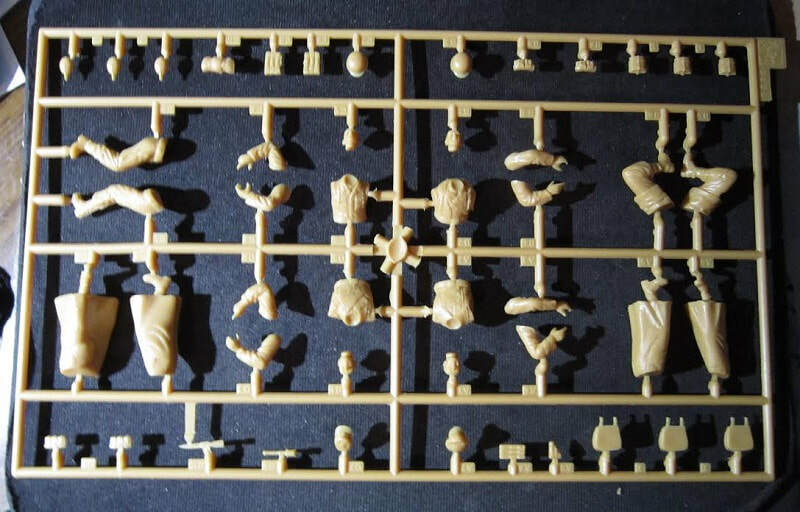 ​The other side panel says that the kit contains parts for four figures and that glue and paint are not included, in 6 languages including English. This is followed by Marco Polo Import, INC's street address in City of Industry, CA and their FAX number. Marco Polo was the U.S. importer of DML kits back in the 90's. The kit has a copyright date of 1994 and it was made in Hong Kong, China. The bottom of the box serves as the assembly and painting instructions. There is a 2-view in color of each of the 4 figures and 2 color swatches of camouflage patterns. Below this is black and white line drawings of a M44 uniform, a motorcycle coat and a M42 greatcoat. All illustrations are done by DML's resident artist Ron Volstad. The kit contains a large light-tan tree, a small light-grey tree and a PE fret that has a pair of glasses on it in 3 sealed cello bags. 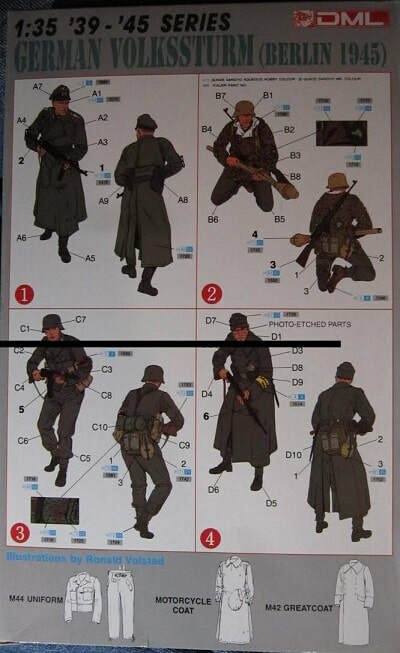 The large light-tan tree holds: the parts of the figures (divided into separate heads, torsos, arms and legs), 4 ammo pouches for a 98K carbine, a bayonet in scabbard, a potato masher type grenade, a soft field cap, an officers hat, a pistol holster, 3 bread bags, 3 MP40 ammo cases, 3 canteens, a rolled tarp, 2 steel helmets and 3 mess kits (48 parts). The small light-grey tree holds: a MP40 sub machine gun with its wire folding shoulder rest, a MP44 assault rifle, a 98K carbine and a Panzerfaust (6 parts). 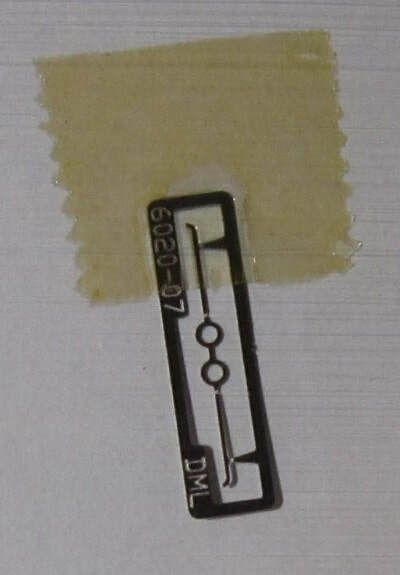 ​The tiny steel PE fret completes the kits contents. It holds a pair of glasses. ​These are nicely detailed figures. However, the poses are a little ho-hum.